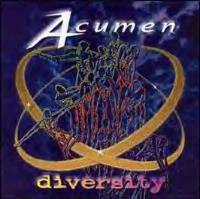 Acumen is the brainchild of Dimitrious James. Diversity, their third full album, features James with Cyndy Teseniar (vocals), Tim O'Neill (drums), Jared Manker (bass), and Justin Todhunter (guitar). The album is progressive rock. However, if that term makes you think of Yes and Genesis, then you are only getting part of the picture. Indeed, the sound on this album appropriately is very diverse. They take the classic prog sound and merge it with the styles of the late '60's political rock. The name Jefferson Airplane certainly comes to mind. They also seem to bring an unlikely sort of modern sound to this decidedly retro blend of music. The album is not without it's flaws, though. Some of the material is a bit awkward and it does drag in parts. However, fans of progressive rock and melodic rock should appreciate the disc as a fresh change of pace. This begins with the spoken words, "Hello and welcome". Then a succession of similar statements in various languages begins. These start to merge with effects and the chaotic effects crescendo as the voices speed up more and more. A high-pitched hum/whistle takes the fore. Then an acoustic guitar based melody that sounds a bit like early Hawkwind ensues. This plays through before being replaced by the main song structure, which feels a bit like the Who meets the Jefferson Airplane in a prog stew. It explodes around and reinvents and explores the theme in a very quirky sort of progressive rock adventure. Eventually the earliest acoustic driven melody of the song returns to take the cut to its conclusion. A hippie sounding fast paced riffing starts this cut, and it begins building from there. This is another that at times feels a bit like the early more acoustic; hippie influenced sort of Hawkwind. It includes some killer vocal interplay and a great arrangement that take that hippie, slightly country style and makes it prog. Beginning with a meaty bass line, as the guitar enters a very tasteful melodic interplay unfolds. The cut eventually becomes an acoustic guitar driven prog excursion with strong debts owed to the sound of Jefferson Airplane. It is another that has a bit of a country feel to it at times. This is one wild ride of a jam. This one has a more simple texture to it, but has some of the more complex vocal harmonies on the album. Once again, the '60's psychedelic rock textures are here with a little country flavor thrown into the mix of this prog piece. Some of the guitar on this one gets a bit Howeish. This cut has a more mainstream prog texture to it than the previous pieces. It has a driving sort of progression and rocks out pretty well. At times this one feels just a little like Rush. It is a very strong track. After a false ending it comes back in screaming and the Rushish tendencies are magnified for a time. This one ends with percussion. Starting with acoustic guitar that calls to mind a European café, as it continues that sort of texture remains with the piece simply building its balladic styles on that foundation. After a time in this mode it virtually explodes into a very powerful prog jam that has a wonderful texture. The soaring guitar work and driving arrangement at times calls to mind Yes. After this instrumental break runs its course, the track drops back down to an acoustic ballad mode. Coming in like the early Who do their take on Yes, this one is a fast paced, hard-edged prog arrangement. As it carries on the early Yes tendencies really show up in spades with some definite Hawkwind overtones as well. This one feels quite a bit like Flash at time, and even a little in the vein of Renaissance. Starting as an acoustic ballad, this one evolves by building on this fairly simple foundation. After working around this melody for some time, the cut opens out into an expansive jam that soars at times and has a cool percussive texture. After wandering through that landscape for a time it drops back down to its humbler beginnings. Starting in a mellow form, this one quickly breaks out into a driving sort of prog mode that feels a bit Yesish at times. At some points the guitar work and arrangement feels just a little like early Rush. This one starts in a more pop rock type of mode. It drops down to a more sedate balladic style and begins building from there. It stays pretty close to its beginnings in its evolution, but is a considerably strong cut. With an intro that is based in a pretty balladic mode, after a brief building on that style a '60's hippie rock sort of sound emerges. Musically this one feels a lot like a cross between Flash and Jefferson Airplane. As it makes its way through its various changes and transformations it eventually drops back to its opening to end. A juicy jazzy guitar jam begins this one. A crescendo ushers in a new section of the jam. This one feels just a little like Santana at times, but the overall texture of the bulk of the piece is closer to Renaissance. This is definitely an inspired jam. It drops to balladic mode to end. However, the slightly annoying hum/buzz that heralded the beginning of the album returns after this. It is followed this time by more of the spoken voices. The message this time is, "thanks for listening."